You wouldn’t ask an Eskimo how to build a sand castle, so why ask anyone but your customers about your online store? Customers are an invaluable source of information, capable of highlighting what's missing or broken and what's getting in the way of conversions. There are several channels capable of capturing customer information: comment sections, social media, live sessions, emails, in-product request forms, (dare I say face-to-face conversation), the list goes on. But none are more effective and detailed than the humble survey. Not only a spotlight on areas in need of TLC - surveys are also an incredible source of market intelligence - you'll learn things about your business and your market that no 'best practice' guide or hurried Google search could ever tell you. We all know that “your most unhappy customers are your greatest source of learning” (thanks Bill), but what about your happy ones? The in-between ones? What else can you learn from a simple set of questions? In this blog post we’ll explore the main advantages of surveying your customer base, featuring some first-class examples of survey requests. Perhaps a quest more prudent than the question of life itself: measuring customer loyalty. One method of discerning loyalty is by calculating your Net Promoter Score (NPS) - an index ranging from -100 to 100 that measures the willingness of customers to recommend a company's products or services to others. A simple “How likely is it that you recommend [insert your company] to a friend?” will help you figure out your customers’ opinion and help build a picture of loyalty. Customers answer on a scale of 1 to 10, with 1 being not likely at all and 10 representing those that are extremely likely to recommend you. Those that answer in the 9 or 10 range are considered promoters and have the best potential for being brand advocates. Those that score low can be further targeted to understand their dissatisfaction (and ultimately you can implement actions to correct their misgivings). Surveys can locate these all important brand champions, whose kind words can exponentially increase your company’s profile and positive associations. Ecommerce marketers can befriend these industry influencers and tap into their social channels (for example), asking for product reviews as a source of (cheaper) multi-channel advertising - or move the relationship beyond social, sending a quick email to let them know how much you appreciate their support (with a nice discount perhaps) to help nurture the relationship (and encourage some cheeky sales). NPS is a vital KPI for ecommerce, the “one number you want to grow” in fact, according to an article of the same title in the Harvard Business Review. “The only path to profitable growth may lie in a company’s ability to get its loyal customers to become, in effect, its marketing department,” writes Frederick F. Reichheld in the Harvard piece. “The path to sustainable, profitable growth begins with creating more promoters and fewer detractors and making your net-promoter number transparent throughout your organisation,” he adds. Marketers can use a customer survey to assess the origins of a customer's relationship with a brand, finding out how they first heard of you. Information about where your customer came from is invaluable - it will help to highlight your most important channels and help you direct resources to where your brand is most visible (and invisible). Marketers can then target resources towards the channels that resonate most with their customer base, or maybe highlight lucrative channels in need of some TLC. Similarly, a simple “where do you like to shop” question can highlight the key online destinations your customers frequent. This data can be used to improve product placement: increase attention for popular online destinations and axe poor performing outlets. And look how Kate Spade attempts to establish their customers' prefered shopping channels. This information can help retailers tweak their next marketing strategy to win sales across specific channels, based on data. 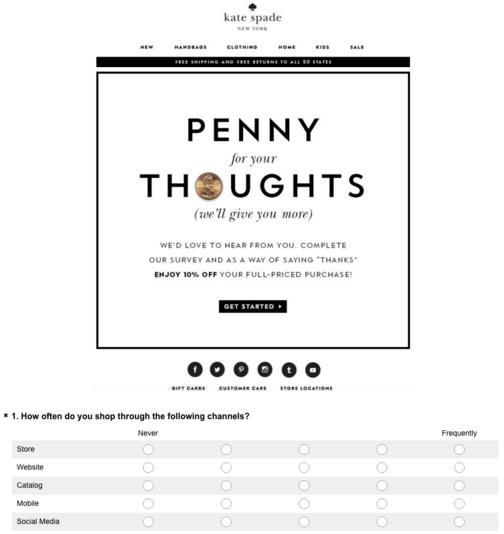 Surveys can be an awesome tool to target lapsed customers and see what scared them away. Product? Service? Price? Ecommerce marketers can identify what went wrong, and highlight what needs to be done to win them back. 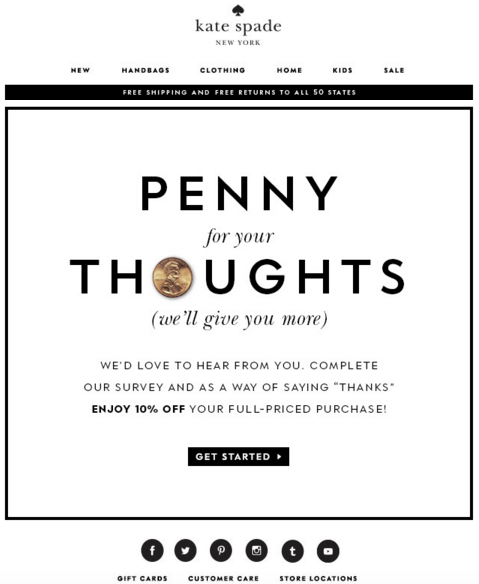 What's more, a simple survey question along the lines of 'do you intend to shop with us again in the next [x] months?' can reveal that customers you assumed were lapsed are, in fact, not lapsed at all. If this is the case for enough of your customer base, you may want to rethink your win-back strategy. Customer surveys are an excellent way to sidestep (expensive) market research firms, providing relevant feedback from your very own consumer cache. Want to develop an app? How about surveying your customer base first, to see if they would even use it before ploughing thousands of pounds and minutes into something that wouldn’t increase profitability or service satisfaction. 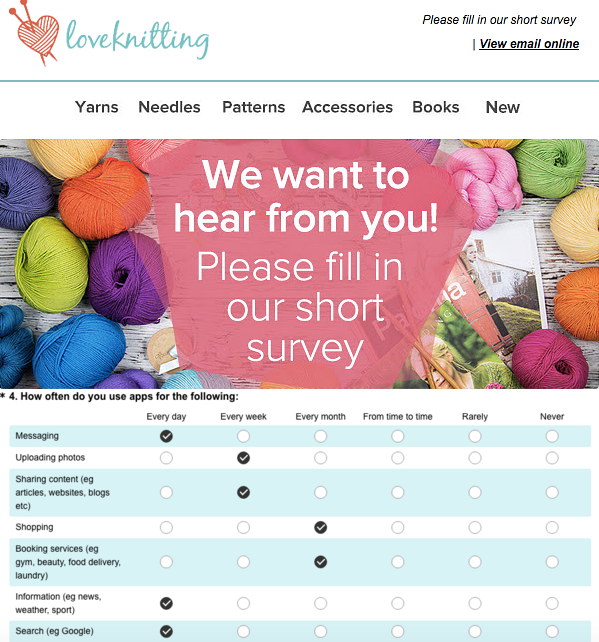 Take a look at Love Knitting’s survey asking its customers to rank the importance of apps in their daily lives to assess whether they’d shop via app (and whether they should invest in building one). Surveys can also be used to gather information regarding their latest advertising campaign, their latest magazine cover, their website design etc, a simple way of gleaning information that matters most. The results can be used to highlight key flaws in the product and allow your company to react to real-life comments - an invaluable tool to assert your brand as proactive company, willing to listen to its customers (and ultimately improve product). A survey can also be used to identify opportunities for new products by using a customer satisfaction survey to see what expectations aren’t met by existing choices. Making customer feedback part of your marketing strategy will reap rewards. Regular communication between you and your customers will foster a two-way relationship and remind your customers that you’re there, and listening. Loyal customers can be rewarded for their ongoing support, welcomed into your VIP fold like royalty. A simple set of questions can determine the exact demographics of your customer base, enabling you to target specific groups at specific times. You can employ demographic segmentation which divides the market into groups based on variables including age, gender, family size and life cycle. Understanding the demographics of your customer base will determine who, where, and how you want to market your product, customer retention and loyalty. When an organisation spends time focusing on its customers and their wants and needs, customers will typically come back. Incentivise: completing surveys isn't the most exhilarating of experiences - make it worth your customers' while by offering something in return, like free shipping or money off their next order. Explain the value: emphasise that the feedback that customers provide will help you provide them with a better experience. Don't ask for too much: sure, it's exciting to get valuable customer feedback, but don't go overboard by asking so many questions that the recipient zones out and fails to complete the survey. Make it look appealing: don't stick with your surveying tool's default design - ensure that you keep any survey in-line with your brand's image. Equally, when you're emailing customers to ask them to contribute, ensure that your emails are just as appealing as your regular newsletter and triggered communications. Ask one or two open-ended questions: longer-form testimonials could provide valuable social proof to use in your marketing (provided you have permission, of course). Want to give surveys a go? 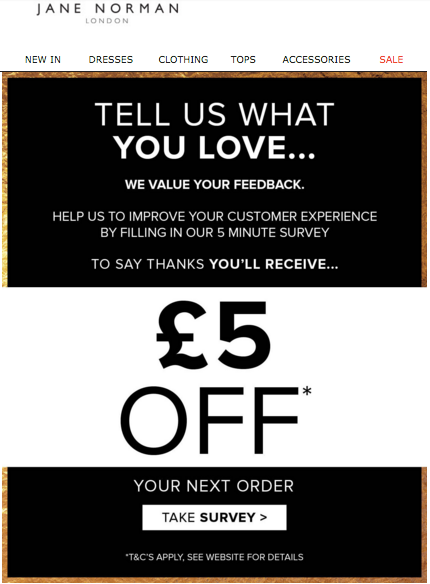 Below are four more examples of sterling survey emails from top online retailers. Why we love it: GIFs GIFs GIFs, we love GIFs! This bright, colourful and powerful CTA grabbed our attention and got us clicking within seconds. Boohoo's survey request conveys brand image and the prize-based incentive is enough to get anyone talking. Why we love it: Earning £1 for every minute spent on completing this survey sounds pretty good to us. 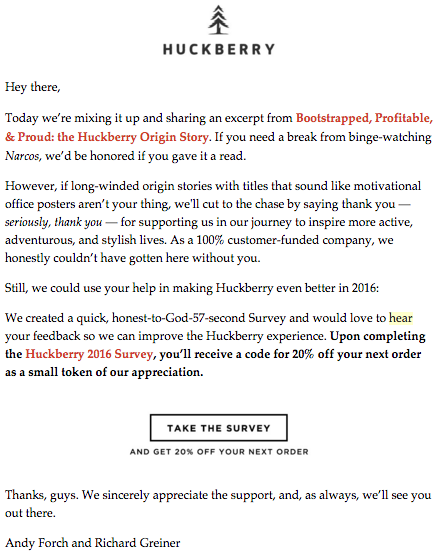 Why we love it: Huckberry's copy is powerful, grateful and above all: genuine. After filling out their survey we feel like inviting them round for a cup of tea - you're very welcome! Why we love it: Playing on the popular idiom inspires an immediate connection with the brand. The nice copy and the discounted incentive encouraged us to click! Surveys are an essential tool to canvas the expectations and perceptions of your very own customers. Through a simple set of questions you can gauge customer opinion, foster engagement, highlight under-used resources and flaws in your product and/or service to improve your brand and ultimately, increase sales. Be clear, be specific and ask a lot of questions. 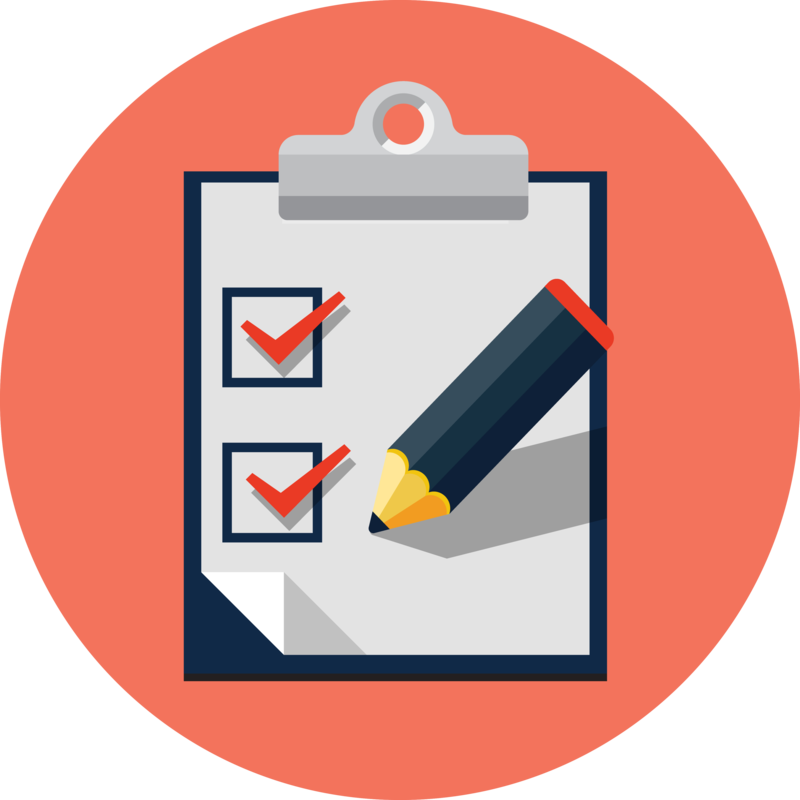 Conduct surveys regularly (at least once or twice a year) in order to regularly assess your performance and focus your customer satisfaction efforts.